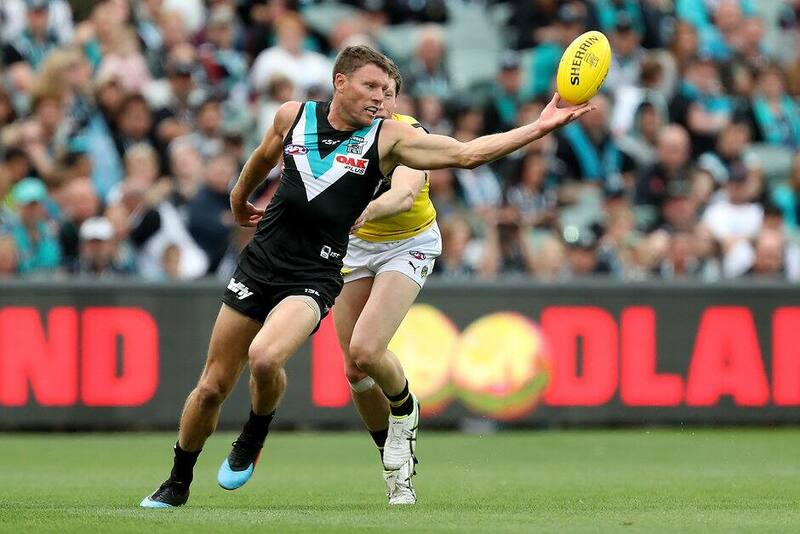 THERE were some familiar names at the top of Port Adelaide’s AFL Fantasy list in Round 4. Tom Rockliff was back to his point-scoring best after only managing a half of football against Brisbane the week before. Rockliff led all-comers on the ground with a score of 132, while Brad Ebert (121), Travis Boak (109) and Ryan Burton (102) each made it to three figures. Brandon Ellis (116) was the best for Richmond, with the rebounding defender racking up 28 touches and nine marks. Rockliff made it scores of 115+ in three of the first four rounds in season 2019 against the Tigers, with his only failure coming when he was concussed in Round 3. The 29-year-old is averaging 114 so far this year - 138 if you take out his half-game against the Lions. His price has risen $109,000 already this season and with a breakeven score of 97 heading into Round 5, expect his price to continue to rise. Ebert has surprised many with his scoring this year, after many thought it would drop off with him spending more time in Port’s forward half. He has started the season with 109, 121, 61 and 121 and still looks a handy player in a fantasy midfield. Ryan Burton (102) has been a very good inclusion into the Power’s defensive group, and I’m sure fantasy coaches will agree. Burton brought up his first ton on the weekend against the Tigers, but has been more than serviceable in his first three games as well. The former Hawk is averaging 88 in season 2019 and with a breakeven of 54 heading into the clash with West Coast, his stocks will continue to rise. What an amazing start to the season for Travis Boak, bringing up his fourth consecutive 100+ score. Boak has averaged 127 across the opening four rounds, with scores of 144, 138, 118 and 109. His price has risen $148,000 since Round 1 and he finds himself with a breakeven of 97 heading into the Eagles clash. The 30-year-old is right at the top-end of expensive players but if he continues to score the way he is, you would be mad not to have him in your side.